2. Place flatbreads on pizza tray or baking pan. Pour 1/2 Tbsp of Pastamore Basil Parmesan Dipping Oil onto each flatbread and spread evenly with a spoon. 3. Rinse apple, cut in half, and remove core. Cut apple into 1/4" thick slices. Lay slices flat onto the flatbreads. 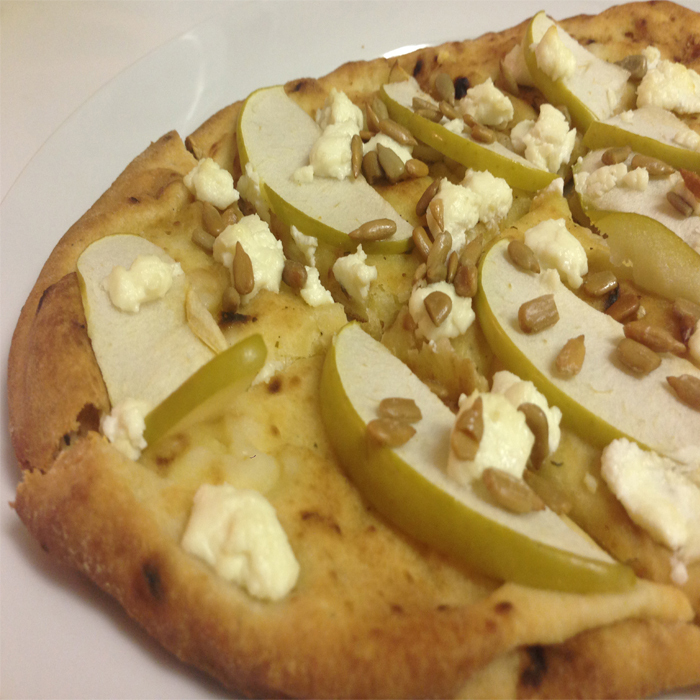 Place chunks of goat cheese across the top, and then sprinkle 1/2 Tbsp of sunflower seeds onto the top of each flatbread. Place into oven and cook for 10-14 minutes or until desired crispness has been reached. 4. Remove flatbreads from the oven and drizzle the remaining Pastamore Basil Parmesan Dipping Oil onto the flatbreads. Cut as desired and serve.